a division of BetterByDesign Nutrition Ltd. This recipe is posted as a courtesy to those following a variety of low-carb and ketogenic diets (not necessarily Meal Plans designed by me). This recipe may or may not be appropriate for you. 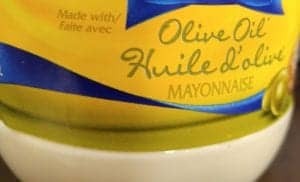 Many people buy ‘olive oil mayonnaise’ without realizing it is only canola oil mayonnaise with added olive oil. The first ingredient is canola oil. This popular brand reads “made with” in fine print. So much for people’s good intentions of substituting a healthy monounsaturated fat for a refined, industrial seed oil like canola. 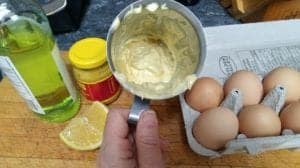 I’ve been wanting to make my own mayo for a while, but my concern was using raw egg due to the risk of salmonella contamination. Then I found out that pasteurized eggs are available for purchase in the US although I have been unable to find them here, but there are instructions online for how to do it yourself. It’s super easy. All you need is an accurate thermometer and a few minutes of time. 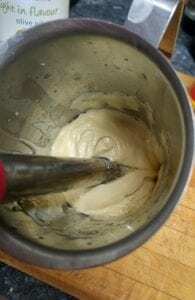 Today, I pasteurized a dozen eggs and then made real mayonnaise. There are only two things to keep in mind to be successful. Be sure to have all your ingredients at room temperature before you begin and use “light” or “light-tasting” olive oil. There are several brands, including in-house brands of this that come from Italy. 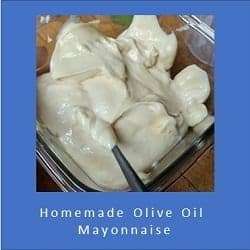 While I love cold-pressed extra virgin olive oil on everything else, I’ve read in multiple places and been told by a girlfriend that makes her own mayonnaise that the result is too heavy and bitter if made with cold pressed oil. This one is just perfect! 1 -Place the egg, mustard and salt in a tall, thin metal pitcher and stir in only 1/4 cup of olive oil. Mix thoroughly. 2 -Insert a stick blender and turn it on high, then very slowly drizzle in the remaining cup of olive oil. Note: don’t rush this part, because adding the olive oil too fast will result in the mixture separating. 3 -After all the oil has been added and the mixture is emulsified, add the vinegar, lemon juice and stir gently with a spoon to blend. 4 – Store the mixture in the refrigerator in an airtight container. Note: This is the link that I used for pasteurizing eggs. I calibrated a new thermometer with boiling water (100° C) to be sure temperature readings were accurate and would encourage you to do the same. Temperature accuracy is critical here, as is time. Please read their disclaimer at the bottom and their note for pregnant women avoid raw eggs. Previous PostPrevious Which Low Carb Diet? There are many ways to do “low carb” and “keto”!